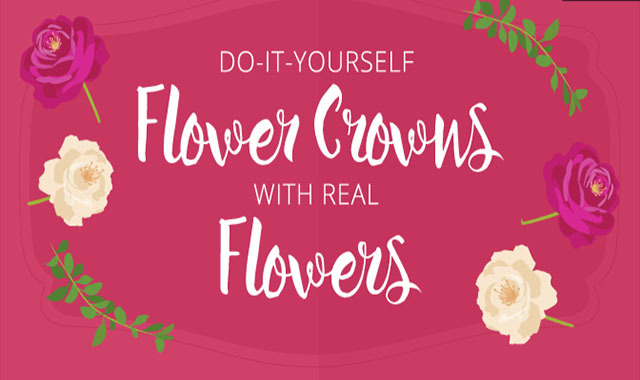 Making Flower Crowns with Real Flowers #infographic ~ Visualistan '+g+"
For centuries, flower crowns of all styles and fashions have conveyed meaningful messages and been an honored tradition worldwide. They have been an essential part of special ceremonies such as weddings, festivals, and rituals. In fact, flower crowns are still an important part of the Midsummer celebration in Sweden. There’s something a little bit magical about them, and we find them irresistible to this day. Flower crowns are worn at weddings, bridal showers, birthdays, anniversaries, and festivals, on May Day, or to welcome the first day of spring. They are simple to craft and, once you’ve created a few for yourself, will make excellent gifts for friends. They are a special and unique pick-me-up!